Clapping is very old, very common, and very tenacious — “a remarkably stable facet of human culture.” Babies do it, seemingly instinctually. The “applause sign” is evidenced by the “the three clap test”. This is a simple test, which shows pathological responses in a variety of diseases (especially with the presence of a dysexecutive syndrome, such as in advanced Alzheimer disease, advanced Parkinson disease (PD), FTD, other subcortical and cortical dementia, stroke with strategic locations). However the applause sign could be relatively specific to the progressivesupranuclear palsy (PSP) (Dubois et al. Neurology 2005). In the “three clap test”, the patient is asked to clap three times as quickly as possible, but only three times after demonstration by the examiner. 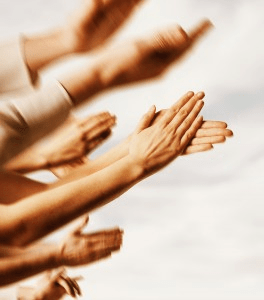 The performance of the subject is normal when he or she claps only three times or abnormal when he or she claps more than four times or when he or she initiates a program of applause that he or she cannot stop. Abnormal performance indicates an applause sign. In my clinical experience I found an applause sign in almost all the patients with PSP whom I examined. The presence of this sign altogether with the classical oculomtor findings, the presence of a dysexecutive syndrome, parkinsonian features and delayed verbal and motor responses makes the diagnosis of ProgressiveSupranuclear Palsy (PSP) highly probable. In my personal experience, in comparison with patients with Parkinson Disease (PD) or other diseases, patients with PSP are not able to correct the perseveration at the “three clap test” although they were repeated to do not that. PSP is related to tau lesions in the frontal cortex, basal ganglia (caudate included) and brainstem. The “applause sign” should be a perseverative behavior appearing as the consequence of severe fronto-subcortical disturbance. Questa voce è stata pubblicata in Progressive Supranuclear Palsy. Contrassegna il permalink.